LBS Centre for Science and Technology has invited application for various posts in the Engineering Colleges (LBS Institute of Technology for Women, Poojappura, Thiruvananthapuram and LBS College of Engineering, Kasaragod). Candidates who wish to apply for various posts should provide online applications before 2nd July 2014. Application should be submitted online to the Director, LBS Centre for Science and Technology, Palayam, Thiruvananthapuram in the given format prescribed for each category provided in the website of LBS Centre for Science and Technology (www.lbscentre.org / www.lbskerala.com). Here are the names of posts for which applications are invited. The printout of the application submitted online along with, duly signed by the candidate along with required certificates should be submitted to the Director, LBS Centre for Science and Technology on or before the specified date as a proof of applying for a post. The candidate must have to retain a copy of the printed application along with the registration ID for future reference and correspondence. A submission fee in the form of Demand Draft drawn in favour of the Director, LBS Centre for Science and Technology should be send along with the application form. The general candidates, the application fee for categories 01 to 08 and 20 to 23 shall be Rs.750/- while for categories 09 to 19 and 24 it would be Rs.500/-.For SC/ ST candidates the application fee is fixed to Rs.375/- for categories 01 to 08 and 20 to 23 and for categories 09 to 19 and 24 it shall be Rs.250/-. The last date and time of submitting application both online and printout is limited to 2nd July 2014, 5 PM. The selection is made after conducting objective type tests (OMR Valuation)/interview/proficiency tests. 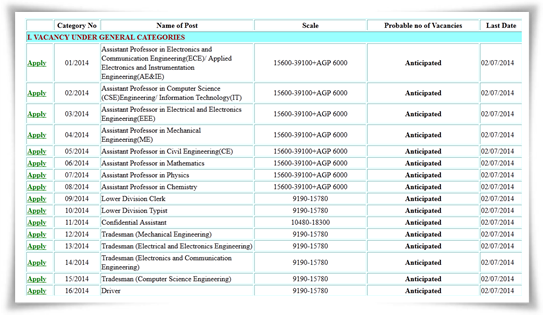 Rank lists for each category of posts will be prepared after the final test. The details of selection process will be published in due course in the website of LBS Centre for Technology.